I appreciate that this may not apply to everyone. Some people prefer the middle slice, an altogether more uniform and yielding experience, devoid of any edges, contrast and – dare I say it? – character. Of course I’m not going to judge you on your brownie preferences (ok, maybe I am), but they do say that variety is the spice of life and there’s something about the contrast of texture as crisp, chewy crust melds into smooth, fudgy middle that makes a brownie pretty much perfect in my eyes. I’m not alone in this debate. The crispy-edge phenomenon is such that you can even buy a ‘Baker’s Edge’ brownie pan, designed so that every slice delivers a crisp corner for guaranteed texture satisfaction. Beyond the world of brownies, this preference can be seen in the infamous triple cooked chip (crispy on the outside, fluffy in the middle) or chocolate chip cookies, where anyone who’s anyone suggests that they need to be baked big enough to allow each texture to develop: the crisp crust, the chewy outer edges and finally the soft, melting centre. The search for the perfect brownie is one that will never end, not least because nobody can agree on exactly what it is that makes one just right. But forget the cakey, fudgy, chewy, chocolaty debate – even within my own fairly made up mind on the matter, I always have a sense that an elusive better brownie may be hiding just around the corner. The result of this is that I rarely bake the same brownie recipe more than twice. I have to add in a little more chocolate or sugar, reduce the butter or add in some sort of syrup, stir more quickly, whisk more slowly, throw in add-ins or strip them back to basics. I first heard about the idea of using golden syrup in brownies from this Nigella-worthy post. Having forgotten about it for a few months, I then encountered the original recipe in my Paul A. Young cookbook, a chocolatier fast becoming a firm favourite in the little loaf household for his ability to help overcome my inability to make a good ganache. The amount of butter is slightly reduced, replaced with golden syrup and lashings of melted chocolate (of course), all adding up to make a rich, dense brownie. My addition to the proceedings is a small amount of cocoa powder (brownies always seem to taste better with both chocolate and cocoa) and the way in which these brownies are baked i.e. the crispy edges. The end product of a moist dark batter baked in individual moulds is a beautiful brownie with a shiny, crackled crust, crispy edges and a dense, deliciously fudgy middle. They’re incredible served warm with melting vanilla or pistachio ice cream, but every bit as delicious as a mid-morning snack, tea time treat or anything in between. They come in single servings so there’s no fighting over who got a bigger piece (but also no surreptitiously sneaking an extra sliver from a square when no one’s looking) and they bake up nice and deep meaning lots of lovely middle surrounded by all that crispy crust. 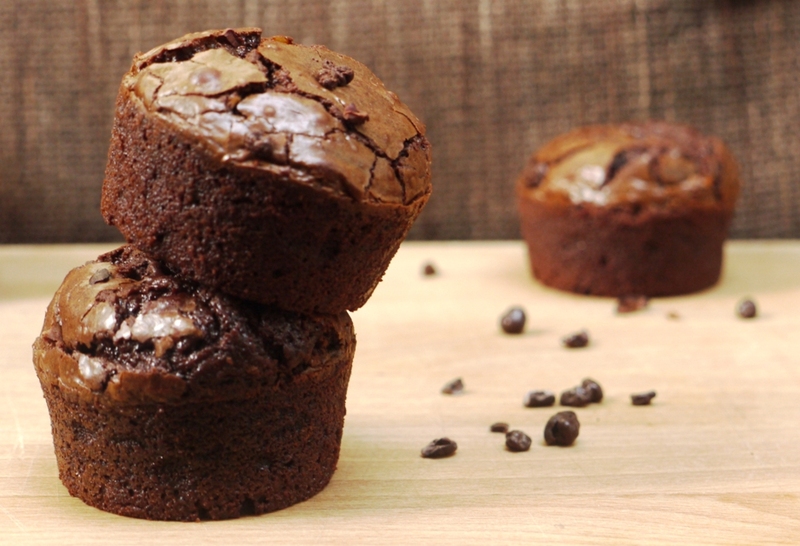 I’m calling them brownie bites because it sounds good, but they’d actually make an absolutely massive single mouthful. So please eat them slowly, enjoying in several bites. The slower you eat, the more time you have to work out exactly how you can justify taking a second . . .
Preheat the oven to 170 degrees C. Grease an eight hole muffin tin or, if using a non stick silicone tin like I did, simply set on the side. You could also bake these in little muffin cases if you want them to be portable. Melt the chocolate and butter in a bain marie, stir in the golden syrup then set aside to cool slightly. In a medium bowl, whisk the eggs together with the brown and caster sugars until pale and thick, about 5 minutes. Whisk the cooled chocolate mixture into the egg mixture, taking care not to incorporate too much air. Fold in the flour and cocoa powder and stir to combine. Pour the mixture into your prepared muffin tins, filling practically to the top (they won’t rise very much). Sprinkle with the cocoa nibs if using and bake for 18 – 25 minutes. Baking time will slightly depend on the temperature of your oven and you don’t want to overbake these, so check them at an early stage. The middle should still have some wobble and a toothpick inserted should come out with moist crumbs clinging to it. Remove from the oven and allow to cool completely before tipping out of the tins. Serve immediately or store in an airtight tin for a couple of days. These brownies also freeze well (and I’ll show you what to do with them in my next post so watch this space!). Great brownie recipe. I use Golden Syrup in a lot of recipes, but not in brownies – so far. I’m going to make your recipe today. Oooh – I’ve used Paul’s recipe from there before, for the salted caramel brownies – am I right in thinking that you’ve used a 3/4 recipe but upped the flour as well as adding the cocoa powder and changing the method? People have been asking me about the brownies being very gooey and fudgey and I spent some time last night working out if and how I wanted to tweak it. Looks like you got a much cakier texture (the cocoa absorbs more moisture than flour, too) than I did. Though I guess the original had the coconut to absorb moisture, I probably should have replaced it with a little something. Very interesting! Also – edges for the win and I love Paul’s book and chocolates. 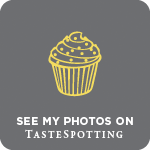 Food Photography & France – you must try it! Emma – yes, I linked to your amazing salted caramel brownies in my post! They looked a-mazing 🙂 This recipe is adapted from Paul’s bing cherry brownie recipe and yes, they are slightly cakier than the original but still very squidgy! I’ve not come across the golden syrup idea before but it’s really intriguing; the resulting brownie sounds perfect and I love the idea of these being portable. I can never decide if I like the middle or the edge of a brownie best but these have a bit of both! I love these bites. 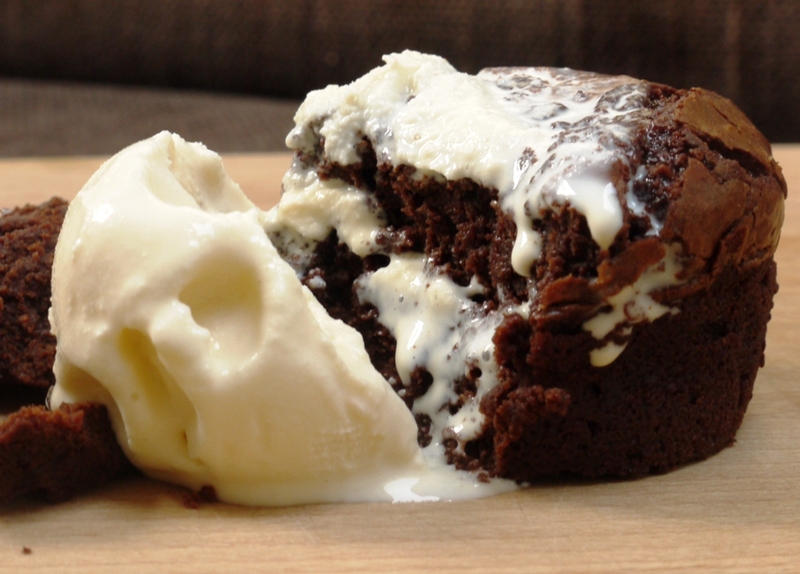 Golden syrup makes such a great chocolate sauce, it´s no wonder it´s great in a brownie batter. Wonderful recipe, love the cocoa nibs! Those look fantastic! I loooooove the edge pieces of brownies, so that definitely applies to me! Wow… must try. They look fantastic – a great idea. I tend to reserve the middle slice, but I always find the edge pleasing because of its almost caramel nature! Kathryn – if in doubt, go for a bit of both. Jenny – I’ve yet to find a perfect homemade pistachio ice cream recipe, but when I do I promise to share it! Bubbly Baker – my pleasure, enjoy! 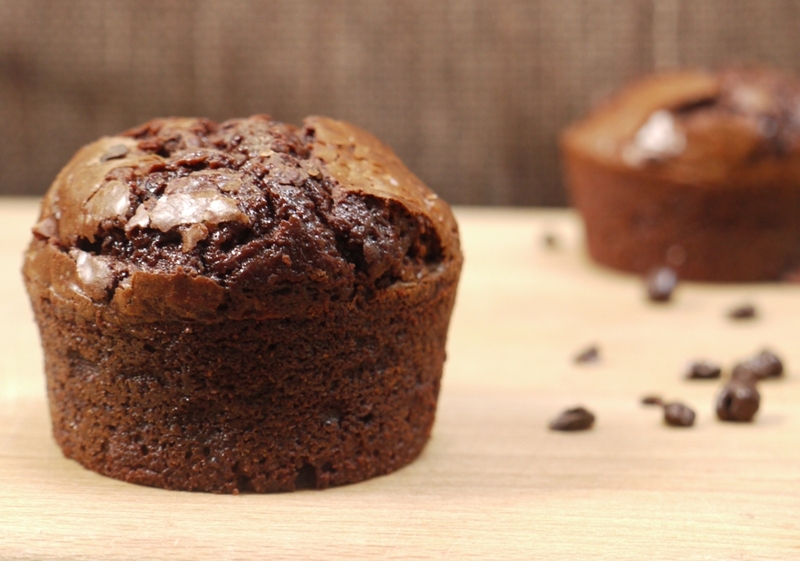 Paula – the cocoa nibs add a lovely crunch to the top. Frugal Feeding – I think the fudgy middle is even more rewarding when contrasted with the crispy crunchy edge, yum! I’m definitely an edge of the brownie pan kind of person and am always seeking the perfect brownie. I have to try these! I’m actually not sure if I’m with you on the middle-edge brownie debate! Suprisingly enough. But I do love the idea of browine bites. Not sure if you have the same brand as here in the States, but there’s this certain type they sell in big containers at the store here… and I have to say, I think they’re my favorite brownie, ever. So I’m really intriguied with making these now!! Must be something about being bite-sized. oh, these little bites look divine! I definitely love the edges. These look very tempting. These look fantastic! I love brownie edges so I think this is a fab idea. delicious brownies. What a treat!! These brownies look absolutely delicious!! I love how perfectly shaped they are, plus the fact that they are still moist and fudgy in the centre. I’m also not a fan of brownies which are too squidgy … my favourite texture would be the part between the outside edge and the centre of the brownie pan! Connie – it’s a constant quest! 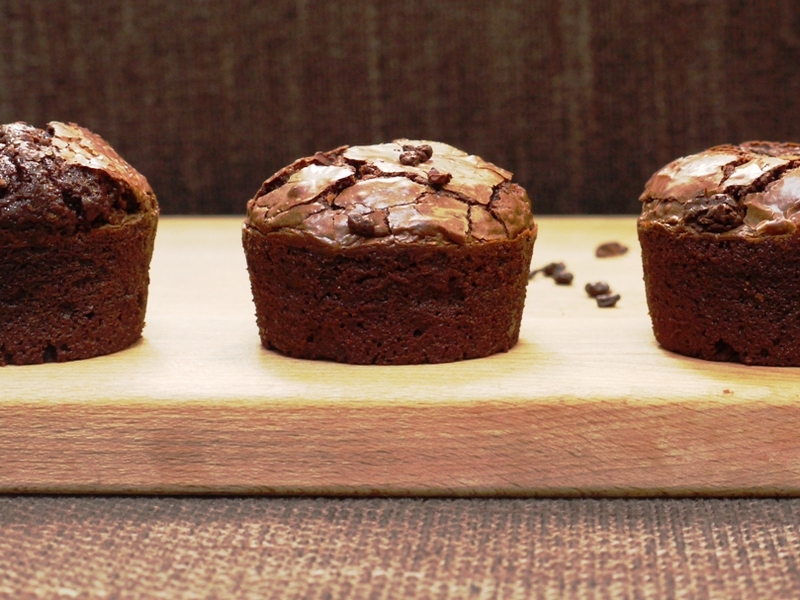 Amy – I like the idea of an everyday brownie and a blow the budget one. I imagine it involves a lot of chocolate! I Love Cake & Tea – glad you like them. Art & Lemons – thanks! 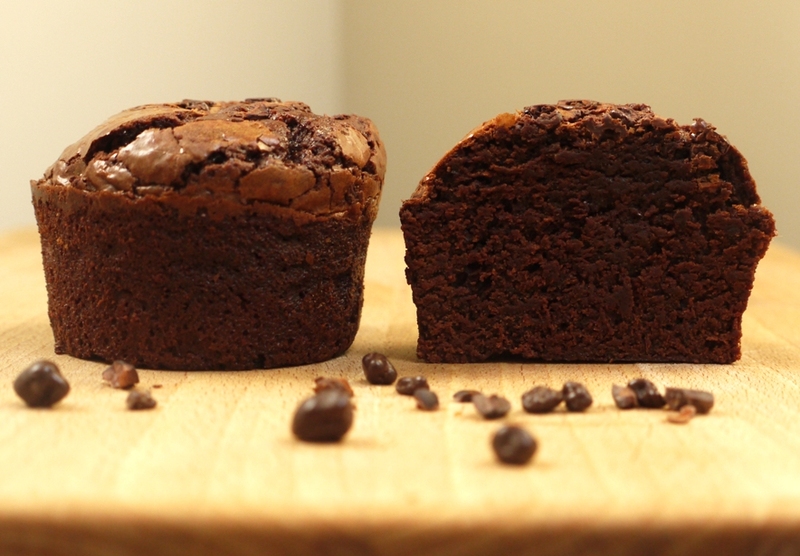 Sylvie – I think that’s the reason I’m on a constant quest for the perfect brownie – a good excuse to eat lots of them! My Little Italian Kitchen – thank you! Thanh – then these are the brownies for you – they still have a lovely fudgy middle. Can I use honey instead of golden syrup and caster sugar instead of golden caster sugar? Normal caster sugar is absolutely fine – they will just taste slightly less caramel-like. As for golden syrup, there’s no direct substitute but you could probably use honey or glucose syrup at a push. Just be aware that the honey flavour will come through quite strongly. Hope that helps! I love brownies–especially those corner pieces 🙂 These look fabulous, wish I could try one! I made these for New Year’s eve dinner and served them with icecream. So much love. They are the most delicious brownies I’ve ever tasted and the recipe is going straight into my book! I wonder if you could also bake them in a square brownie tin or would I have to adjust the proportions? I managed to make 12 brownies/muffins with the quantities you gave. Ooh I’m so pleased you liked them! They should be fine to bake in a tin, you might just need to adjust baking time slightly as the smaller ones bake a little more quickly. Thank you 🙂 Indeed, I was sad to see the last one go today! I love them, thank you so much for sharing. Mine did not rise like yours for some reason. Would you have any advise? Add some baking powder? Thanks anyway, they are delish.